What to Look For In Inflatable Life Vests? When seeking inflatable life vests, there are three important features to consider: oral, manual, and automatic inflation lifejackets. You are getting the automatic Personal Flotation Devices (PFD) when the jacket relies on a dissolvable bobbin and is equipped with a spring-pin arrangement. The water in it disperses the bobbin while the pin nudges the CO2 canister resulting to inflation. In the meantime, the spring-pin mechanism touted as the weak link of the system is the underlying cause why automatic lifejackets come with an oral tube and manual cord. The simplest among the three – the vest’s manual feature can be inflated by pulling a ripcord. To provide more air into it, the manufacturer provides an oral tube. However, an oral tube has two functions: first is its advantageous part in refilling the bladder. At present, the majority of manufacturers release a CO2 cylinder that could not get the bladder entirely inflated. Normally, these bladders can only accommodate 40 pounds of buoyancy-lifting air with the additional cylinder providing the USGC minimum according to the Type Class with only 22.5 to 34 pounds. In inflatable PFDs, comfort can be determined by their accompanying weight and material. As such, lowered weights are very much recommended because these can be utilized throughout the day. The materials should not be ignored, and they should be perfectly suited particularly in the neck section. Another thing to consider is the type. In general, all Coast Guard-acquired types can be used in the open water. 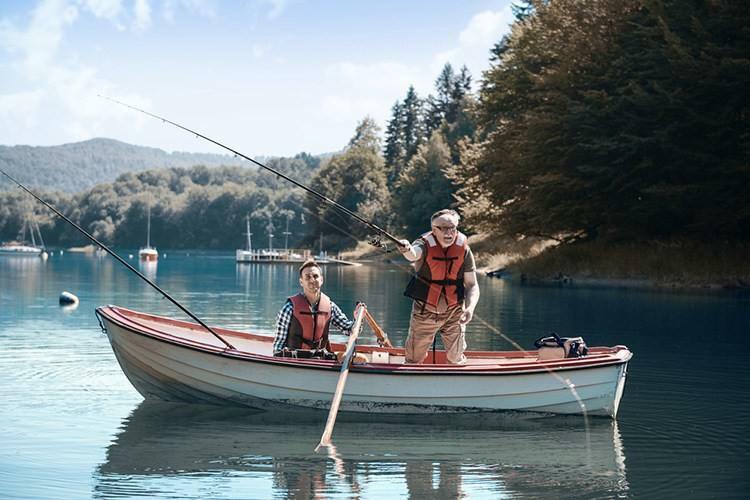 The type V vests are currently being recommended by many fishers because they are durable, small, and comfortable; the overhead variants are perfect for people who frequently snorkel. Most fishers prefer the Manual PFD because it only requires you to know about it, and that’s just it: pull the cylinder release, and it immediately inflates. Also, it demands extremely less servicing. But the Automatic PFD will inflate only once it touches the water. Additionally, only green water can inflate it; an amount of spray could not get the automatic PFD inflated. Most experts recommended an automatic inflation type-V as it could save your life particularly when accidents such as unintentionally going overboard or being knocked unconscious happen. If you are sailing offshore or working on a deck or in a place that constantly gets caught in rough water, an inflatable PFD equipped with a harness is highly recommended. Moreover, it is wise to choose an automatic inflatable life vest if you are an inshore sailor or a power boater. In contrast, manual PFDs are highly encouraged if you are sailing offshore. The majority of power boaters and solo mariners now prefer an inflatable life vest with harness; the removable harnesses in these PFDs are almost always available. Before you purchase your inflatable life vest, ensure that they would work for your chosen activity. In general, inflatable PFDs have a unique system, making them unsuitable for every type of water sports activity. They are not explicitly suggested for non-swimmers and as previously mentioned for activities such as white water, tubing, wakeboarding, and skiing. One more thing to consider is its availability that caters only to adult sizes. You need to be 16 years old and weigh 80 pounds for you to use the inflatable life vest. This is the main requirement often checked for maintenance purposes. Cartridge Viewing: When you use the CO2 cartridge, it is important that you check your cartridge's status. When it has gotten low, you need to replace it immediately or else the life vest will not inflate. Buoyancy Weight: If you are the heavy type, this metric needs to be number one on your checklist. In general, the more buoyancy you are getting, the PFD is bound to hold you up more. Coast Guard Stamp: If the Coast Guard doesn't approve your PFDs, then the odds are that these life preservers can only be utilized for light activities such as snorkeling. 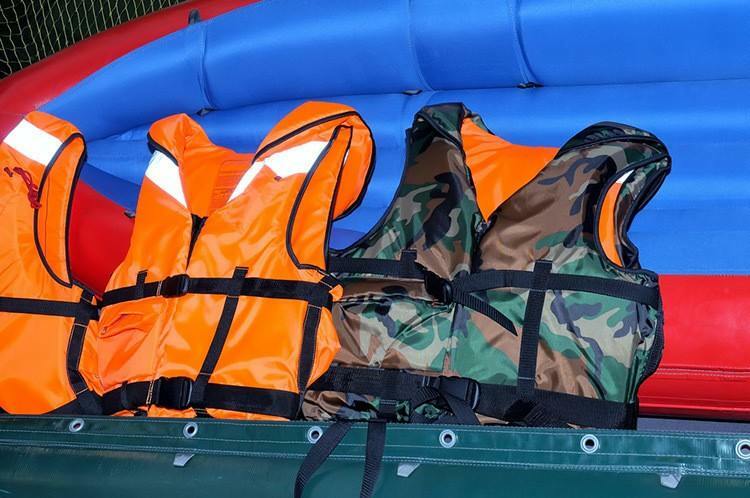 However, if a vest has a Coast Guard stamp, then these are perfectly safe to use while you are out in the open water along with accidents and other dangerous situations. Price: This vest can protect you from impending threats when water surrounds you. In fact, you can’t put a price on this piece as long as it is rated well. Choose a variety that’s worth your money. Without further ado, I have identified the following fishing life vests to narrow down your choices. Onyx by Absolute Outdoor is a manual and automatic inflatable fishing PFD for the sea. The Absolute Outdoor Onyx is a US-approved being a type-V life jacket which has a type III performance. The Onyx can inflate automatically and manually. On the right-hand portion of the jacket, the red handle activates the inflation manually. But if the user becomes immersed in water, it will inflate automatically? With outstanding durability from the 200-denier nylon material, the Absolute Outdoor Onyx is right for heavy use. Its slim design keeps you cool under hot weather conditions, unlike traditional life jackets. If you are seeking for an unobtrusive life jacket, this life preserver is perfect for your safety on the water. Hopefully, you won’t have to deploy the life jacket’s emergency inflation, but you can be certain that this PFD will work when you need it. The safety of your kids is most important when you’re out at sea because they will certainly not be strong swimmers. Utilizing an adult life jacket for a kid is unsafe as they are not specifically designed for children. With three adaptable strap belts and a 50 to 90 pound-weight limit, this life vest is perfect for most babies. However, I would not purchase this vest unless the child has younger siblings. The majority of kids do not wish to be left out from the other kids in the family. But luckily, Stearns has created several identical life vests for adults and their children, so you all have the same look. Another life vest whose goal is to get unconscious users to face upwards is the ONYX Adult Universal Type 2 USCG. When a person is unconscious and is facing down the water, there will undoubtedly be a fatality if nobody is there to assist him. The ONYX Adult Universal Type 2 USCG is a US Coast Guard-Approved PFD, fitting adults over 90 pounds with a chest width of between 30 and 52 inches. The universal life jacket will fit nearly all body types and offer the users with life-saving flotation. The ONYX Adult Universal Type 2 USCG life jacket is a first class yet inexpensive vest that comply with the standard laws. However, the downside is that they are rather bulky but still comfortable to wear. Youth size fits children 50 pounds to 90 pounds. O’Neill Life Vests are a popular product in the clothing and water sports market, and their life jackets are extremely popular. This USCG approved life jacket utilizes closed cell PVC marine foam technology to offer maximum buoyancy. The material is durable – a nylon that can endure heavy duty activities. Also, thanks to its quick release buckle feature, removing the life jacket is easy and fast. If you are after a stylish and branded life jacket, then O’Neil is your perfect PFD. The Mustang Survival Corp M.I.T. is not your regular, inflatable, fishing life vest. This appealing creation from Mustang has singled out everything in ensuring that the features required are present and functional! From the Mustang PFD’s Coast Guard stamp down to its original Membrane Inflatable Technology, this vest certainly knows just how to work well. Are these the best life jackets, lightest and most durable inflatable vests for fishing you’ve ever encountered? Don’t they have all the features and functionality you need for nearly every water activity? Yes! These jackets are designed and made to serve you for a couple of years, so there is no downside to the cost. Whether you require a life jacket for Jetskiing, boating, or any other water sports, these are the jackets for you. Pick one that will satisfy your needs. There are a variety of color options that match your style. Visit Amazon now, and purchase your very own inflatable vest.